Officer Jordan Coble was named the 2018 Police Officer of the Year. The award is voted on by members of the Police Department and was presented by Chief Grant Gillespie at the department's Christmas party. Officer Coble joined WPD in 2017 and has been very active patrol officer, making solid criminal cases and is great at interacting with the community. The award was sponsored by Porch, Stribling and Webb Insurance. Taylor Porch is shown congratulating Officer Coble. The Waverly Department of Public Safety (Police and Fire) is accepting applications for the position of Part Time (Paid Per Call) Firefighter. Part-time Firefighters respond to all fire related calls for service within the City of Waverly and would be available on an on-call basis as needed. Training and equipment are provided. Have good moral character as determined by a thorough background investigation. Work and/or reside in or near the City of Waverly and have availability for on-call status. Questions concerning the application process may be directed to Chief Grant Gillespie at 931-296-4300. The City of Waverly is an Equal Opportunity Employer and is a drug-free workplace. On Friday evening, a victim had her car forcibly taken from her after stopping at the railroad crossing on Clydeton Rd near Hwy 70. The suspect, David Tyler Lowery, of Trinity, AL, jumped into the passenger side of her car while she was waiting on the train to cross. He told her he had just walked away from the nearby Hope Center Drug Recovery Facility and was trying to go to Decaturville. When she turned onto Hwy 70, Lowery grabbed the wheel and pushed her out of the car as it came to a stop on Hwy 70. The victim immediately called 911 and a description of the vehicle was broadcast. The car was stopped by New Johnsonville Police Officer Joe Yates and Lowery was taken into custody. Lowery is being held in the Humphreys County Jail and is charged with Carjacking, Reckless Endangerment, Reckless Driving, and Assault. His bond is set at $73,000. 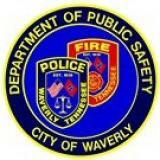 The Waverly Department of Public Safety-Police and Fire is accepting applications for the position of Public Safety Officer (Police Officer). The Department of Public Safety is a 24 hour full service Police and Fire Department. Because of the unique mission of the department, Public Safety Officers are required to perform both law enforcement and firefighting duties. All Public Safety Officers are required to complete the Basic Police Academy and Basic Fire Academy. Public Safety Officers are required to work shift work and are on call 24/7. The application process includes a physical ability test, written police entry exam, oral interview panel and extensive background check. Successful candidates will undergo drug screening, physical and psychological exams and polygraph. Details of the process will be provided to applicants. Application packets can be picked up at the Waverly Police Department or downloaded at www.waverlypublicsafety.com. Applications will be accepted through Noon on Friday, January 5, 2018. Questions concerning the application process or the compensation and benefits package may be addressed to either Captain Devin Elliott or Chief Grant Gillespie at 931-296-4300. The City of Waverly is an Equal Opportunity Employer, and is a drug-free workplace. The Waverly Police Department K9 Unit received a grant providing health insurance coverage for its Police K9, Crockett. The insurance will reimburse the department’s special drug fund for veterinary expenses. “This represents considerable savings to the department and allows us to use funds we would normally spend on our K9 in other drug enforcement programs,” said Police Chief Grant Gillespie. K9 Crockett is handled by Officer David Ross, a 30 year veteran of the Police Department. Crockett is trained in drug detection, tracking and apprehension. “Vested Interest in K9’s has provided Crockett a bullet resistant vest in the past and they show their concern for police dogs nationwide through their grant programs,” said Officer Ross. Vested Interest in K9s, Inc. is a 501c (3) nationwide charity located in East Taunton, MA, whose mission is to provide bullet and stab protective vests and other assistance to dogs of law enforcement and related agencies throughout the United States. The non-profit is pleased continue their “Healthcare for K9 Heroes” program which launched in 2016. The charity will supplement their initial donation of $10,000 in 2016 by donating an additional $10,000 in 2017 toward a medical reimbursement programs for a number of self-funded K9 units. The “Healthcare for K9 Heroes” grant will be awarded to departments who have the financial burden of raising funds to support their K9 unit, who have no more than three K9s, and who have previously been awarded a vest through Vested Interest in K9s, Inc. Law enforcement dogs ages two through seven will be eligible. The medical reimbursement insurance policy will cover illnesses, injuries—including those sustained in the line of duty—diagnostic testing and therapies. In 2016, the pilot program for the charity awarded twenty-four K9 recipients with an annual policy at a cost of just over $10,000.00. Selected as 2017 recipients to date are: Waverly, TN Police Department, K9 Crockett, Tom Green County Sheriff’s Office, TX, K9 Pusinka, Camp Point, IL Police Department, K9 Poseidon, Palmer, MA Police Department, K9 Buddy, Hadley, MA Police Department, K9 Nomar, Madison, FL Police Department, K9 Bolt, Attica, IN Police Department K9 Dirk , Grant County Sheriff’s Office, WA K9s Grizzly and Chicka , University Hospital of OH, K9 General, Cass County, IA Sheriff’s Office, K9 Vader, Dalton MA Police Department, K9 Max, Cass County, IA Sheriff’s Department, K9 Vader, and Ballard County KY Detention Center, K9 Abby. The Vested Interest in K9s, Inc. grant will allow for the provision of a Trupanion prepaid annual policy. The plan allows the freedom to use any licensed veterinarian, specialty center, or emergency hospital in the United States, and Puerto Rico. The program will be administered by Trupanion. In addition to the healthcare reimbursement program, the non-profit has provided over 2600 law enforcement dogs with bullet and stab protective vests in 50 states, at a cost of 2.1 million dollars. For more information, please call 508-824-6978. Tax deductible donations accepted via mail to: Vested Interest in K9s, Inc. P.O. Box 9 East Taunton, MA 02718 or via the website: www.vik9s.org. Trupanion is a leader in medical insurance for cats and dogs throughout the United States and Canada. Trupanion is committed to providing pet owners with the highest value in pet medical insurance. Trupanion is listed on NASDAQ under the symbol "TRUP". The company was founded in 2000 and is headquartered in Seattle, WA. Trupanion policies are issued, in the United States, by its wholly-owned insurance entity American Pet Insurance Company and, in Canada, by Omega General Insurance Company. For more information please visit Trupanion.com. Waverly Police Department Detectives arrested Charles Shear, 22, of Waverly, last night on a charge of Second Degree Murder in the death of his wife, Brandi Shear, 22, of Waverly. Officers were called to a residence at 105 Curtis Dr. on a report of gunshots being fired. When the Officers arrived they discovered Brandi Shear deceased in her vehicle in the driveway. Waverly PD Detectives Mike Hubbs and Jonathan Fortner are investigating the incident with the assistance of the TN Bureau of Investigation. The investigation revealed that shots had been fired by both the husband and the wife during the exchange. No one else was injured in the shooting. Charles Shear is currently in the Humphreys County Jail under a $300,000 bond. The Waverly Police Department is partnering with the Tennessee Highway Safety Office (THSO) for its annual Seatbelts Are For Everyone (SAFE) campaign. This statewide initiative is designed to increase seatbelt usage and child passenger safety restraint usage through the implementation of occupant-protection programs, public events, and checkpoints throughout local communities across Tennessee. The SAFE campaign begins February 1, 2017, and concludes on August 1, 2017. A website has been created to help maintain information about the 1978 propane explosion that occurred in Waverly. During discussions between Mayor Buddy Frazier and Public Safety Chief Grant Gillespie, the idea to have a central website dedicated to the event and administered by the City of Waverly was born. The website is located at www.waverlypropaneexplosion.com and is maintained as part of the Department of Public Safety's Website at www.waverlypublicsafety.com. The new site will combine information such as articles, pictures and videos concerning the disaster. "We wanted a place that brought all the information into one place and to help memorialize the event for future generations", said Chief Gillespie, "Anyone who would like to contribute to the website should get in touch with us and we will incorporate any information relevant to what happened that day." The 1978 event claimed the lives of 16 people including the Police Chief and Fire Chief and hospitalized 43 others. The event served as a turning point in emergency management across the country. Sgt. Shaun Wilson has been named the 2016 Waverly Police Department Officer of the Year. The officer of the year is selected by members of the police department and goes to the member who best represents the values of the department. This is the second year in a row that Sgt. Wilson has been selected and he is the only officer who has won the award three times. "Shaun is a professional officer who consistently demonstrates the high values and expectations this community expects from its officers," said Chief Grant Gillespie. This year's award is sponsored by Porch, Stribling and Webb Insurance Agency. Below is Taylor Porch presenting Sgt. Wilson with the award. Applications will be accepted through Noon on Thursday, September 15, 2016. The Waverly Police Department responded to a call of gunshots being fired on Parkwood Drive in Waverly on August 31, 2016, at approximately 8 p.m. Responding officers found two female victims who had been violently assaulted by suspect Stephen Jerese Turner, 28, of Waverly. They were treated for their injuries at Three Rivers Hospital and released. Turner is the ex-boyfriend of one of the victims and the victim had an active order of protection against Turner. He also had an outstanding arrest warrant for violating the order of protection. The girlfriend and her friend had returned to the apartment to retrieve personal items under the belief that Turner was not there. Turner was concealed in the apartment and attacked the victims when they entered. They ran out of the apartment and were assaulted in the front yard. During the assault, Turner fired several shots from a handgun at the victims as they attempted to get away. Neither victim was struck by the gunfire. He fled back into the apartment when neighbors dialed 911. Initial reports was that he may still be in the apartment when officers arrived. The area was secured and neighboring apartments were evacuated. The Waverly Police Department Special Operations Team was called to the scene and were able to determine that Turner had fled out the back door before officers arrived. The Waverly Police K9 Team followed a track to the Waverly Country Club golf course nearby. Waverly Police Officers took Turner into custody shortly after midnight after he broke into a vacant house approximately a mile away on Hwy 13 in Waverly. The house was owned by members of Turner’s family and no one else was present in the home. He was taken into custody without incident and the gun believed to have been involved in the assault was recovered. Turner was charged with two counts of Aggravated Assault and Violation of an Order of Protection. Outstanding warrants for Violation of an Order of Protection and Violation of Probation were also served. He is housed in the Humphreys County Jail on a $160,500.00 bond. Officers from the TN Highway Patrol and Humphreys County Sheriff’s Office also responded to the initial incident. Chief of Police Grant Gillespie said, “This was a violent domestic assault by a suspect who twice ignored an order of protection. We are fortunate that the victims were not critically injured.” Detectives are continuing to investigate and additional charges may be filed. Chief Grant Gillespie has announced the promotion of Officer Chris Taylor to the rank of Sergeant. Sgt. Taylor is a 4 year veteran of the Department and was a supervisor with UPS prior to joining the Waverly Dept. of Public Safety. He has also been a Field Training Officer, responsible for training newly hired Police Officers and Firefighters. He will assume his role as the night shift supervisor beginning June 12. The Waverly Police Department is requesting any information regarding the burglary of Waverly Lumber Company located on Highway 70 East. Between the dates of January 19th and February 1st, someone entered Waverly Lumber Company and took several items. Items include miscellaneous power tools, plumbing supplies, paint, stains and electrical supplies. Anyone with information is asked to call Detective Fortner or Sergeant Hubbs at the Waverly Police Department (931-296-4300) or Humphreys County CrimeStoppers at 931-296-2414. Calls to Humphreys County CrimeStoppers remain anonymous and a cash reward may be available for information leading to an arrest for this crime or any other major crime or drug activity. The Waverly Police Department has received several reports of check scams in the area. The scams come in several forms, but usually involve the victim receiving an unsolicited check informing them they have won a lottery, sweepstakes or other prize. The victim is often asked to cash or deposit the check and then send the scammers some or all of the cash. The check will not clear the bank and the victim is left responsible for the insufficient funds, including what was sent to the scammers. The Police Department encourages anyone who receives one of these check to ignore it and report it to their local police department. These scammers will often follow-up with phone calls or emails to the victim and can be aggressive in their attempts to get money or account information from them. The Waverly Police Department will be partnering with the Tennessee Governor’s Highway Safety Office for the 2016 Seatbelts Are For Everyone (SAFE) campaign. The SAFE campaign is designed to increase seat belt and child passenger safety restraint usage in Tennessee. Law enforcement agencies participate in the campaign by planning and implementing occupant protection initiatives in their communities. This year, participating agencies will pay special attention to nighttime seat belt enforcement. Tennessee has seen a disproportionate percentage of unrestrained fatalities between the hours of 6:00 p.m. and 5:59 a.m. Historically, approximately fifty percent of Tennessee’s traffic fatalities are unbelted. That percentage increases to nearly sixty when nighttime crashes are examined. The SAFE campaign will take place February 1 – August 1, 2016. NASHVILLE – As cold weather sweeps across Tennessee, home and business owners may rely on portable generators during occasional power outages to operate their electrical equipment such as heating units, computers, water pumps and lighting. While portable generators can provide a quick fix, they can also pose unseen hazards that can have long-lasting effects. The State Fire Marshal’s Office reminds residents that following some basic tips can ensure safe generator use every time. Because carbon monoxide is an odorless and colorless gas, it is often referred to as the invisible killer. Since 2013, 12 people have died in Tennessee as a result of non-fire related carbon monoxide poisoning. This past September, Tennessee commemorated its first Carbon Monoxide Awareness Day in an effort to stop this preventable loss of life. Always read, follow, and save the manufacturer's operating instructions for your generator. Never use a generator inside your home, garage, crawl space, or other enclosed areas. Deadly levels of carbon monoxide can quickly build up in these areas and can linger for hours, even after the generator has shut off. Only use your generator outdoors, away from open windows, vents, or doors that could allow carbon monoxide fumes inside. Install and maintain carbon monoxide alarms in your home. Follow manufacturer’s instructions for correct placement and mounting height. Ensure everyone in the home knows to immediately get to a fresh air location should the carbon monoxide alarm sound. Have someone call 911 from outside the home. Know the initial symptoms of carbon monoxide poisoning: headache, fatigue, shortness of breath, nausea, and dizziness (flulike symptoms, but without the fever). If you experience these symptoms during or after generator use, get to a fresh air location immediately and have someone call 911.